Update: We've now had the chance to get up close and personal with this camera – you can read our first impressions in our hands-on: Hasselblad X1D review. 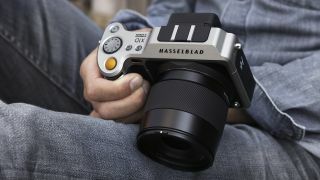 Hasselblad has been making waves in the photography world recently. In April it introduced a medium format camera with an 100MP sensor, and now it's introducing the world's first mirrorless medium format system. Compared to a traditional boxy digital medium format camera, the mirrorless Hasselblad X1D is about the size of a ruggedized tablet and comparatively tiny. Though it features a new panel-shaped design, the new camera body and its ergonomic grip takes inspiration from the company's iconic V-series. It's also not lacking on the resolution front and features a 50MP (8,272 x 6,200 pixels) CMOS sensor, which produces images with 14-stops of dynamic range and 14-bit color. While the camera can shoot video with autofocus, it's disappointingly limited to 30 fps and Full HD H.264 compressed footage – but no one is really buying a medium format system to shoot video. The Hasselblad X1D is also designed to take frames between 60 minutes to 1/2000 of a second long, and it features an ISO range of 100-25,600. The X1D is thoroughly modern with touchscreen-based interface users can tap around on the 3-inch, 920K dot rear LCD. It's also equipped with dual SD cards for storage plus built in Wi-Fi and GPU. There's even a USB 3.1Type-C port, mini HDMI and audio in/out. At launch, the X1D will work with two specially developed XCD-mount lenses including a 45mm f3.5 and 90mm f4.0. Hasselblad also plans to release more XCD lenses and an H-Mount adapter, giving it access to 12 additional lenses. The Hasselblad X1D will arrive this August priced at $8,995 or £5,990 GBP (about AU$12,054) for the camera body by itself. Meanwhile, the XCD 3.5/45mm and XCD 4.5/90mm lenses ring up for $2,295 (about £1,564, AU$3,075) and $2,695 (about £1,837, AU$3,612), respectively. Lastly, Hasselblad will bundle with X1D with the XCD 45mm lens for $11,290 (about £7,695, AU$15,129) or both pieces of glass for $13,985 (about £9,533, AU$18,742).